Concordia’s new president Alan Shepard (right) took office in August 2012. 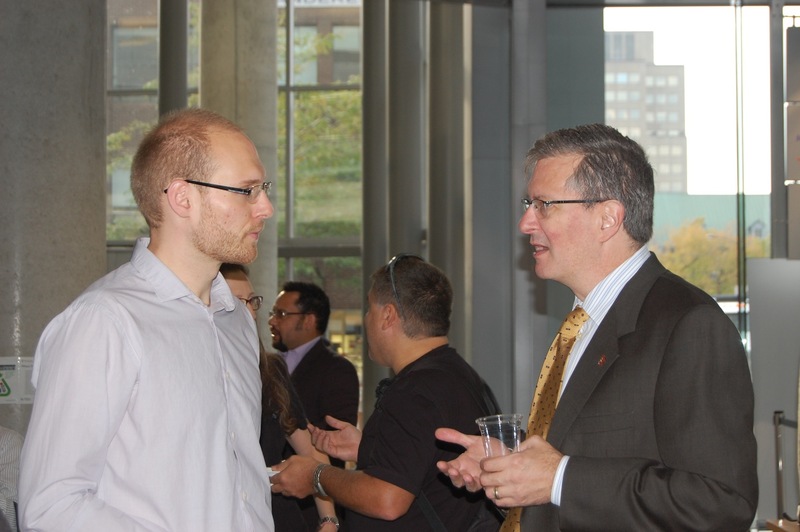 Concordia University’s new president, Alan Shepard, organized a meet and greet with his faculty and staff on Thursday, Sept. 6 from 8 a.m. to 10 a.m. in the atrium of the EV building. Faculty members from various departments of the university showed up for an opportunity to exchange a few words with Shepard and express their concerns to the president. Marie-Pierre Aubé, Director of the records management and archives department, thought the event was a great idea. Shanna Parisien, one of the event co-ordinators is looking forward to the atmosphere Shepard will bring the to the school. “I hope that the president keeps the university as warm and welcoming as it is today,” said Parisien. Many faculty members expressed their concerns about Shepard completing his five-year term and administerial transparency. Perry Shearwood, a part-time faculty instructor at the School of Extended Learning expressed the need for improvement. Shepard emphasized building relationships with others was a main focus of the event.